The links below take you to a GoogleScholar search for each of a selection of science education journals. 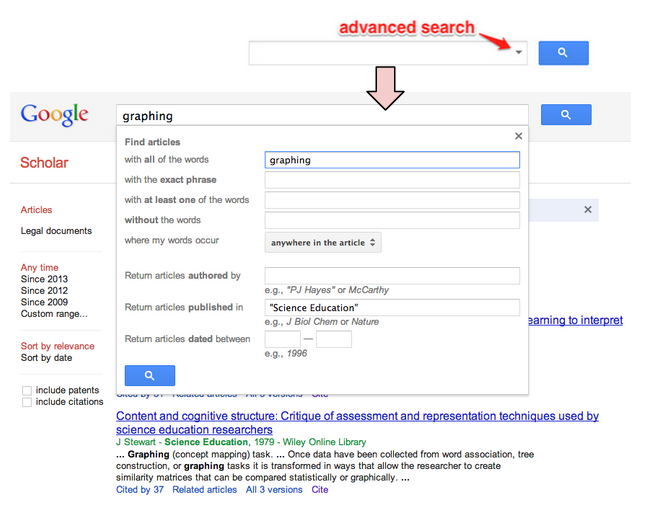 Click on the advanced search arrow in the search box and enter your search parameters. The results will show up, and in most cases you’ll get to read the abstract, often more ( in 2011 over 50% of science articles were released as open-access). Alternatively, click on any of the journals below and enter your search term. It should remember the journal in the results (see the example on ‘misconceptions’ below). If you have other great journals that are worth adding to the list, please let me know in the comments. If you are engaged by academic research and how it applies to science teaching practice (and are in the right time zones), consider taking part in the Science Teaching Journal Club. This site (Real-Statistics.com) is fantastic, and includes a very advanced Excel workbook for researchers. Perhaps beyond your students’ needs, but useful for higher study or action research. Perhaps you could add ‘Science in School’ the European journal for Science teachers? Thanks for the suggestion, Sue!